I am a professional Toronto based cellist available for hire. I perform regularly with various ensembles and am able to coordinate music to suit your event. Whether you would like an acoustic string duo to play classical music for your ceremony or an electric trio to get your party started, I can work with you to organize exactly what you are looking for. 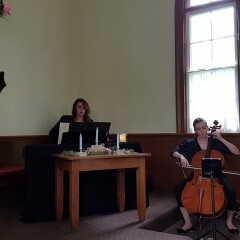 We were so thankful to have Amber play the cello at our sons wedding. She is a joy and very gifted! Thank you Eleanor! Your son's wedding was so beautiful. I felt very welcomed by your lovely family and it was a special treat to collaborate with Beckie and Chris - they are wonderful! Amber was the beautiful finishing touch to our outdoor wedding ceremony. 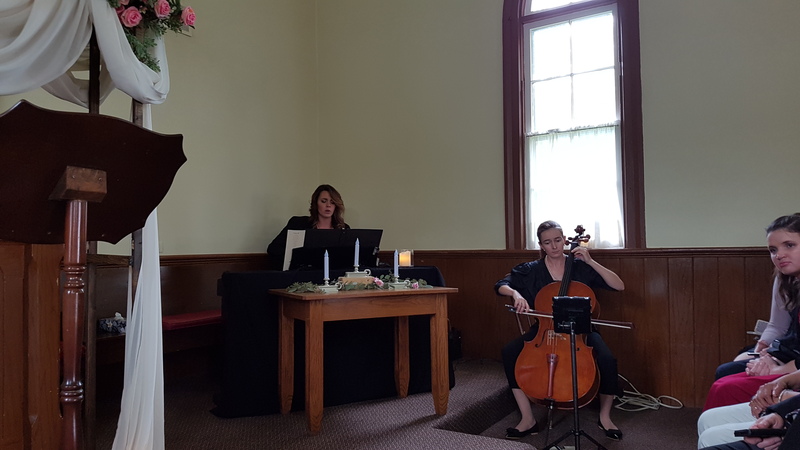 We received so many comments and we really loved that she was able to play all our favourites as part of our ceremony, even a couple songs that weren’t on her song list. She was wonderful! Thanks so much Amber! Thank you so much Veronica! I absolutely loved your wedding. I will never forget playing Over the Rainbow while your grandmother walked with you (and I was so happy to meet her briefly, she's awesome!). Congratulations and all the very best to you and your family. Amber made our wedding ceremony absolutely stunning. Everything we wished for. Thank you Alex! I'm so glad that you were pleased with my contributions. It was an honour to play for you both and for your guests. I wish you a lifetime of happiness together. Amber and her husband came to play at the ceremony of our wedding on May 19th and it was truly magical. Right from the start Amber was wonderful to work with, she was very responsive and took the time to explain expectations. I am so lucky to have found her to play her beautiful cello/guitar duo and heard nothing but compliments from our guests. There was a nice mix of contemporary and classical, she offered suggestions for ceremony music and they were perfect! My bridesmaids walked down the aisle to "What the world needs now is love" and I walked down the aisle to "Hallelujah". It was perfect, thank you so much for making my day so memorable! Amber was amazing!!! we received so many compliments fro our guests on the music and her timing for creating such a special moment for us!!! Amber is a truly amazing musician who left a deep impression on everybody who attended our reception. EVERYBODY commented on how much they liked her music. She was easy to work with, and made excellent and valuable suggestions regarding the program. We are so appreciative of her work -- she really helped set the tone of the big day! It was my pleasure to play for your beautiful ceremony. Such a perfect ceremony with the live music. Everyone loved it and made my wedding even more special! So thankful for such stunning musicians with beautiful talent! Your ceremony was indeed perfect and a real pleasure to accompany. We wish you both a lifetime of happiness together. Amber played for our Yacht club Easter brunch, and our guests loved it. Soft, beautiful and classic and everyone loved her performance. Looking forward to next time! Thank you for the kind review, Charlene! It was such a nice Easter brunch to play for. Hope to play for you again! Amber did a fantastic job at our engagement party. She worked with the DJ to improvise, complimenting the music that he played with her beautiful electric cello. Her performance was an excellent modern addition to our event, and we are looking forward to working with her in the future. Thank you Mahsa! It was such a treat to perform at your engagement party! Amber was excellent to work with and played beautifully at my wedding ceremony. I would highly recommend working with her! Thank you for your positive review, Elyse! It was my pleasure to play for your beautiful wedding! It was a pleasure to play for your event. You are a gracious host! Thank you for the positive review. Very easy to work with and talented! Amber was a breeze to coordinate with and made planning for the entire evening very easy. While at the event, she was very courteous and professional, and played beautifully! Thank you for your positive review, Kent! It was a pleasure to work with you. Your event was full of beauty and I am honoured to have been a part of it. Cellist Amber Walton-Amar has recently reclaimed Toronto as her home base after several years of studying and working in the United States. As a free lance musician she enjoys collaborating with an eclectic range of artists performing a variety of music – from cabaret and black box theatre to glamorous electric ensembles and symphony orchestras. Amber has held principal and assistant principal positions with ensembles including the Chicago Composers Orchestra and South Shore Symphony, with whom she and her husband Zebulun Barnow toured China in 2014. Amber received her Masters in cello performance from Stephen Balderston at DePaul University in Chicago and her Bachelors from Simon Fryer at the University of Toronto. She recognizes valuable mentorship from former principal of the Lyric Opera Daniel Morganstern. Amber is honoured to play a personally commissioned 2013 David Wiebe Cello.